Scarlett is one of the Generals who act as advisors for the player-character in Divine: Dragon Commander. 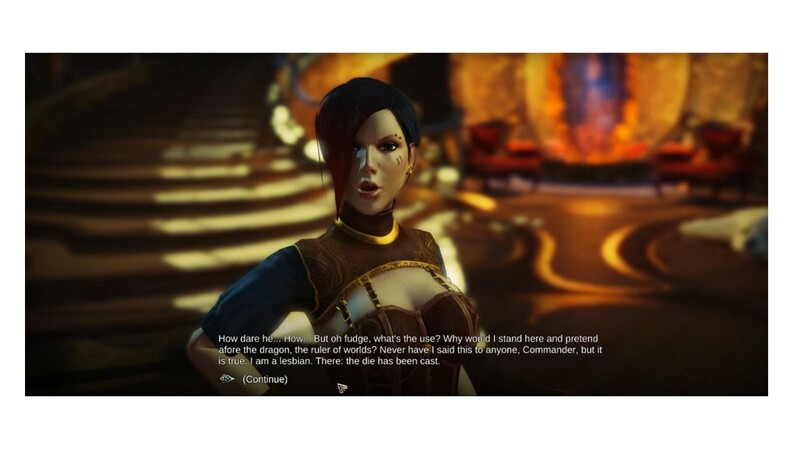 After another General, Henry, spreads rumors that she likes women, she outs herself to the player-character: “Never have I said this to anyone, Commander, but it is true. I am a lesbian.” She tells them that her parents sent her to military school after learning about her sexuality, with threats to disown her if she ever acted on her desires again. The player can decide to keep her secret, or tell her it’s not their business. Based on their decisions, and the gay-related policy decisions, Scarlett will “be proud of her orientation, join a religious order or become a drunkard and sleep with casual [sic] people” (Kaminski). Scarlett’s coming out can be seen here (around 10:20). This entry was posted in 2010s, Characters, Homophobia, Lesbian, Lesbian (explicit), Queer women on November 23, 2015 by Adrienne Shaw.